Update: click here for 2011 data. 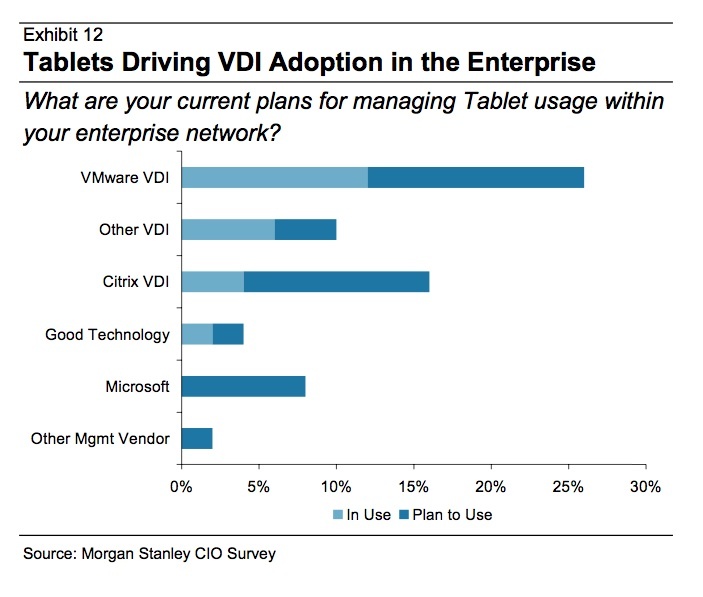 In this previous post, I shared some data from Morgan Stanley about current VDI deployments that shows VMware and Citrix having an even 40%-40% shares of the installed base. Clearly a very competitive market where customers benefit from the resulting pressure to innovate on both vendors. How will this market unfold? Well, I have my opinion, but I am clearly biased, so let me share some other financial industry data I ran into. This preference seems to apply to the deployment of Tablet in the enterprise, which is an area where we have been slower that we wanted to bring products to market but where we are clearly getting a lot of traction now. 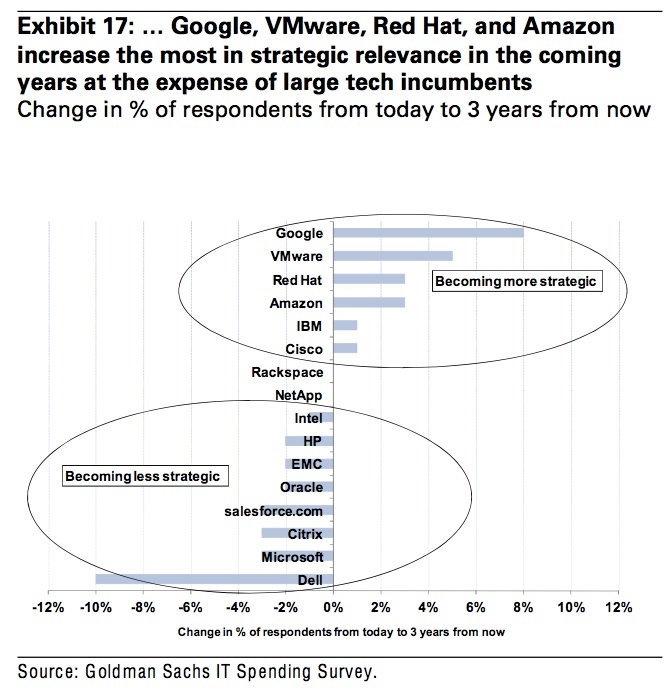 Finally, here is another chart from Goldman that shows who are the vendors who are becoming more strategic to customers future, which further validate the data above. ← Where does the TCO for VDI come from? “more strategic to customers future” What does this mean? More in line with accomplishing business goals? I realize that you didn’t write the report, but the strategy bar graph is really vague. @gregcarrier …and also inconsistent w.r.t. 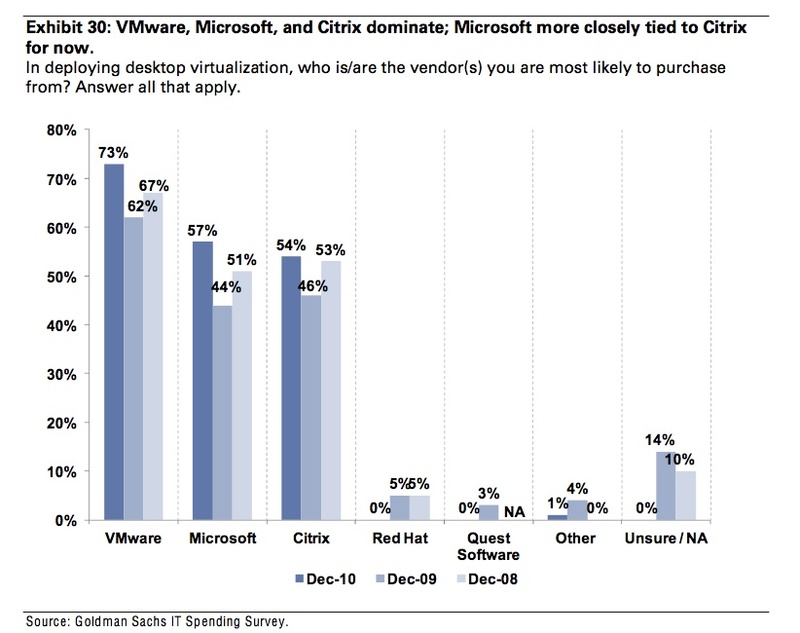 Red Hat: though Red Hat became “more strategic”, 0% chooses them for desktop virtualization in 2010 (as opposed to 5% in the years before).